Ever get to a point that you say to yourself, where do I start? I write these on infrequent occasions to be able to go back and remember parts of my life. They’re usually the painful parts, but I need to remember all of these. It’s said that each time you recall a memory, you change it every so little. Sort of like the boy scouts game of whispering something to one person then they pass it on to another and another till it comes back all twisted. Your memory is just like that ‘cept this memory stuff never takes an outside lap. Each recall can twist and ruin the facts. The end of August / beginning of September had us dealing with a corgi that could not stand up. He couldn’t successfully relieve himself in the yard without dropping back into his poop. Still he had his smile most days and frankly, this dog had so much love around him, imaging the end was just not possible. My memories of September were watching him trying to climb the steps in front of the house and how he’d start with a stretched out paw just reaching the step where he’d pull himself up. Then the hind leg would reach around and swing a few times till it hit. From there he’d pull himself through the door. There were plenty of times he’d get to that point and then sink straight backwards off the step. His determination was a testament to his strength. Each night I carried him up the stairs to bed and I got to give him a giant hug and kiss. Every morning, the same hug and kiss. Around the beginning of the September it got bad. A trip to the vet for a session of prednisone turned into a runaround with the vet wanting to deal with a sudden burst of diarrhea. I got both drugs and we just put him on the pred for a week. Major recovery. He was doing great for a week or so. Then, Sept 22th he faded again. Still bad on the 23rd, bad on the 24th. I realized it was time to think about the end. 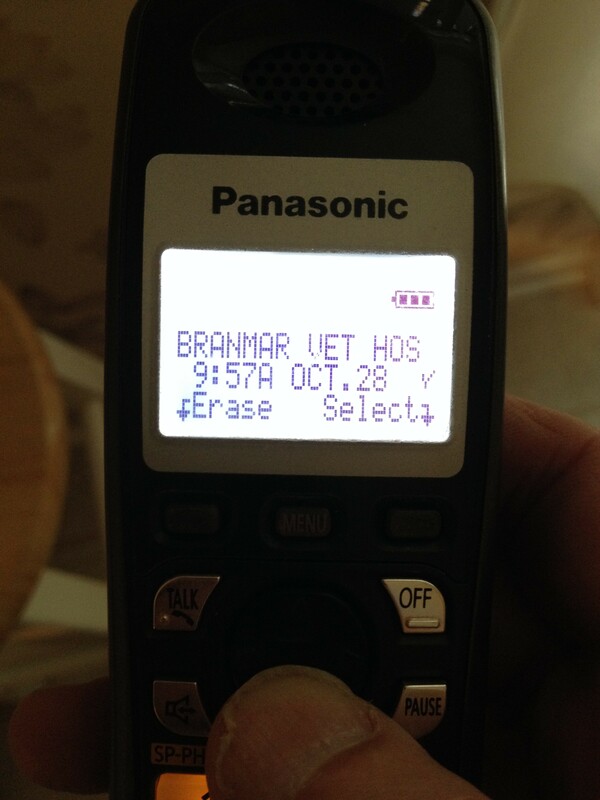 That Wednesday, the 25th I called the vet to schedule something for the weekend. A problem. Our vet was available that night or not again until the following Monday. 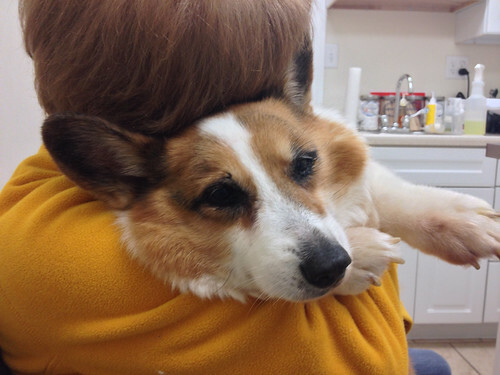 I did not want to go back to the previous vet. I made the decision for that night @ 7:15. The rest of the day was spent in the yard watching George sleep. At 5:00, the phone rang. The vet had to cancel as her daughter was in a traffic accident. We unhappily postponed till the next night with the other vet. But this was a happy turn. The next morning, Thursday, I put George in the yard. I had the doors to my office open. Chloé was in the x-pen out front when I heard George’s bark. Thinking something was bothering him, I looked out, only to see him walking, abet awkwardly, across the yard. Barking at a neighbors dog. I canceled the appointment right them. His birthday was October 16th. I thought, we’re going to reach it! Then, something dropped into our laps that could only be referred to as fate. As I headed out to play golf that Friday morning, I got an email. How are you? Hope you and your dog is doing well. We have a 3 year old neutered male Great Pyrenees available. He is housebroken, crate trained, obedience trained, well socialized, very friendly and has a lot of personality. He has also been trained toward his therapy dog certificate and has done some nose work. He gets along well with other dogs and cats. He also loves children. He does have a lot of energy and personality! We are looking for a good home for him. He is out of Pixie and Matsui. We are asking $400.00. Please let us know if you are interested. Ha! I thought and forwarded it on to my wife. Well, that was the all she needed. Where is it? What’s its name? What’s it weight? What, where, when? And so on so the discussion was started. 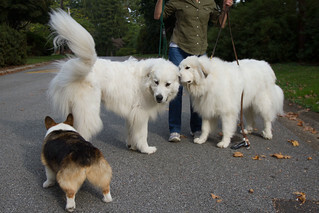 We thought, if and when George past, we wouldn’t be able to look at another corgi, never less buy another corgi. And Chloé? She’d eat the cat! She seemed to be dealing with separation stress poorly. My yes or no was dependent on getting a dog run built. I could do one pyr, not 2. I roped off the left of the yard through the rhododendrons and around the boulders. An estimate was put out for a dog run based on that. I said to my self, if it’s 4k no go, if it’s 3k no go. Above 2k was iffy. I finally got a number back. 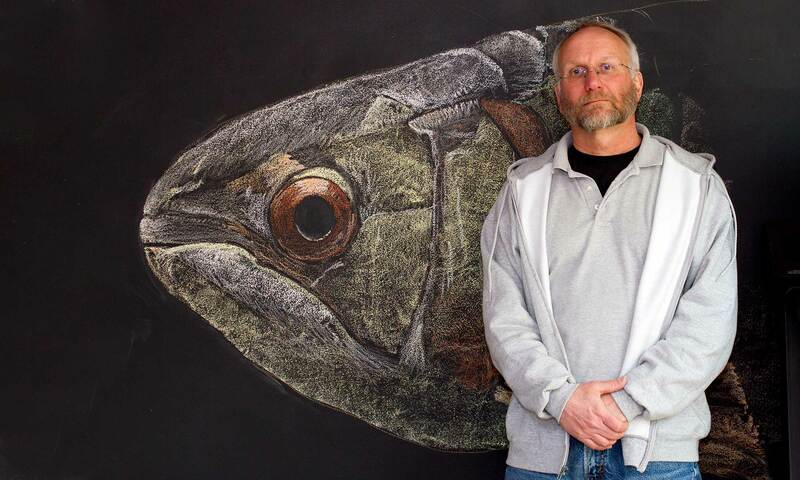 $1700 cash. The deal/dog was on. We scheduled our visit to the kennel for October 3rd. It was a 3 hour plus road trip. Although Karen offered to meet half way, Beth and I, pry lovers, wanted to see the 20 pyrs she had on the property. I mean, who wouldn’t? Our new pup, named Mr. Darcy was a skinny tall lanky man. He greeted us in Karen’s office by jumping up to give us a kiss. We liked him immediately. He was the king of zen on the ride home. Sitting in the back with his head out the window he rode like he was being chauffeured. He would on occasion fall asleep while sitting. This shot had over 6000 visits on Flickr. We decided without any hesitation to rename him Henri. Chloé greeted our new pup like we’d bought her a new best friend. Tail wags all around. Henri was an absolute gentleman with George who had to check things out immediately. The next week or so, brought George around wonderfully. He rallied. He controlled the 2 pyrs like he owned the house. The first weekend while everyone was running around the house. I heard George barking in the TV room. Wondering what could be up, I ran to the room to find George had cornered the 2 big dogs. They were standing in the corner vaguely blinking like sheep while George sat in the middle of the room. They couldn’t get past him and he wasn’t going to let them. He was in his glory. The dog run was built. October 16th came. George made his 15th birthday! The 3 dogs would sit together like a true pack. My office would sound like a steam engine convention with all the huff and puffing from those 2 running around. Days went on. 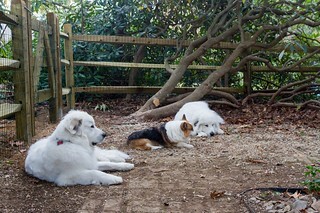 The pyrs would dig in the new dog run. We’d all walk around the yard and the pyrs would rope George with their leads. Everyone was happy. Then, around Thursday, October 24th, George started to fade again. His breath was kicking bad. Getting him to eat was a matter of tempting him with treats, moist food and any other thing. Friday, Saturday was bad. On occasion he’d lift his head and look around. Sunday any water he drank he’d throw up. We decided that night it was the end. I spent some time drawing him in my sketch book. All in all, He was telling us he wanted to let go. Beth decided to stay home with him that Monday. 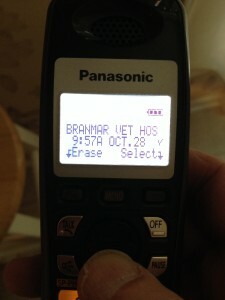 The next morning at 9:00 I made a call to the vet. After a bit of back and forth where the receptionist wouldn’t let us have an appointment till the next day. I finally pleaded “have the vet call me!” She said she’d have the vet call us back. Just before 10:00, we got a call that the vet could see us at 10:30. I can’t tell you how saddened this made both of us. Our fawning over George would be done in 1/2 hour. It was too soon. Memories of having had the whole day with Gracie flashed through my mind. Never less, in 20 minutes, we were on our way. I was struck as to how I didn’t have any music attached to this event as I’d had with Grace. Beth insisted that George ride in her lap. I missed my chance to hold him but, he’s Beth’s dog and she was grieving hard. Once at the vet (28lbs, down from 33lbs.) 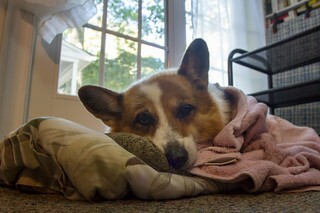 we were ushered to a room, that I’d spent many earlier vet visits with him. He just laid on his side on the towel we’d brought him in on. The vet came in and gave him a sedative. Then 20 minutes later she came in, shaved a bit of his heel (placed in a baggie for Beth) and administered the last shot. My hand was on George’s chest the whole time. I felt him stop breathing. I felt his heart stop. Hardest moment of my life. And then, after mourning him for perhaps another 20 minutes, we just left him on the table and went home. In the end, George made it 15 years and 2 weeks. He was the smartest dog I’ve ever known, but I’ll write about that someday too. Godspeed little guy. We all loved you so much. Previous PostPrevious Seven years on flickr! Next PostNext Memories of George. Originally written in 2010.